Students and higher education institutions in Finland are caught up in the austerity measures their government is preparing to impose. The Finnish economy has been contracting for the past three years and is currently experiencing some of the worst fiscal challenges in the Eurozone due in part to reduced trade with Russia. The removal of the compensation paid for pharmacy services to the University of Helsinki and the University of Eastern Finland. In addition, international students from outside the European Economic Area (EEA) may soon be paying tuition fees if they choose to study in Finland. 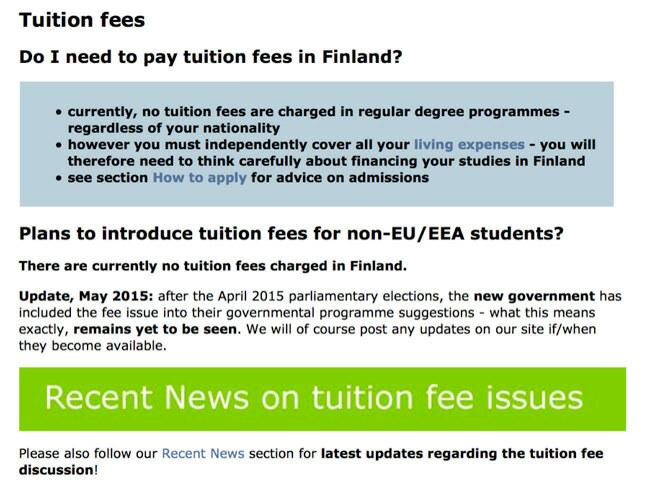 When we last reported on Finland, the government had just backed away from a plan to introduce fees for non-EEA students and decided instead to refer the matter of whether or not to introduce such fees to a ministerial working committee for consideration. On 27 May, however, it revealed that tuition fees are indeed intended for non-EEA students – but it has to this point been somewhat vague about its plans. The flip-flopping on the issue of non-EEA tuition fees is creating a climate of uncertainty for Finland’s higher education institutions, which have been welcoming more students from outside the EU and EEA in recent years, especially from Asia and Africa. The non-EEA markets on this list account for about 60% (or 10,431 students) of all foreign students in Finland. Finland, Norway, and Iceland are currently the Nordic countries that remain tuition-free for non-EEA international students; Denmark and Sweden require tuition fees from non-EEA students. In the two years after Sweden introduced tuition fees for international students, the international student population fell by 80%, but began rebounding in 2012. Student groups and faculty associations have protested the proposed tuition fees for as long as they have been debated; that is, for some years now. They argue that it will have negative effects not just for Finnish higher education institutions but also for the country as a whole, since international students spend money benefiting many other sectors during their study time. These groups believe that a more sensible route would be to encourage more international students to stay and work in Finland after graduation. Currently, about half of international students do so, with the rest leaving the after their studies. Before he won the Finnish national election in April, Prime Minister Juha Sipilä’s campaign platform included a commitment to protect the country’s education budget. Earlier this year, Yle Uutiset reported on research showing that “foreign students may be significantly more expensive than Finnish ones.” With an economy in recession as well as evidence that Finnish students are having trouble finding jobs after graduating, it is possible that popular support may strengthen for the government’s plan to introduce tuition fees for non-EEA students. This entry was posted in Europe, Finland, Higher Education, Most Popular, Regions and tagged college admissions, financial aid for students, Most Popular, European Union student recruitment, tuition fees.